if she brings back the black truffle brie that I asked for. In my eagerness to create/eat I bought up the local Chinese grocer’s stock of rice paper rolls. So, flush with a surfeit of ingredients, I went a bit wacky with the experimenting: Swedish summer rolls, anyone? Actually I think that is a success so I will share it at some point. But the lead recipe is my favourite. I have just cottoned on to the fact that this blog-writing ruse is a great way to justify a spot of greed. Experimenting and making a mess in the name of research. Love it! But I will try and limit it to the healthy stuff. Like these fabulously nutritious rolls. Yeah, I know the the rice is white, but with all the other unprocessed and nutritious ingredients rolled in we can cut ourselves a little slack. If you can get hold of brown rice wrappers, then be my guest. In fact, had I the right kind of brown rice noodles (I usually do but didn’t on this occasion) they would have been used instead of the vermicelli. But anyhoo, stuff these little hot water dipped pancakes to the gunnels with freshness and piquancy in the knowledge that not only do they taste fantastic, they are perfect parcels of goodness – and summer. 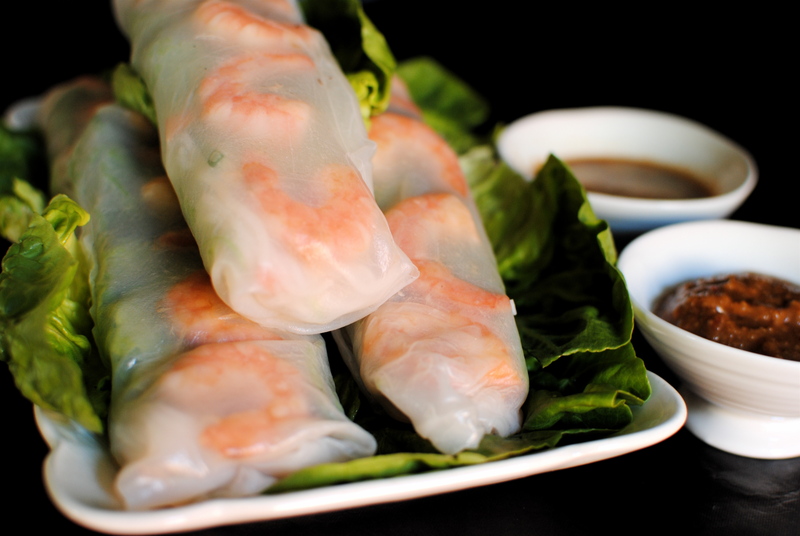 And that’s my angle today: to me, summer rolls just say ‘summer’. Funny that. As our Scottish – nay, British – summer has itself been on holiday somewhere warm and sunny, it is up to food to put me in a carefree mood. 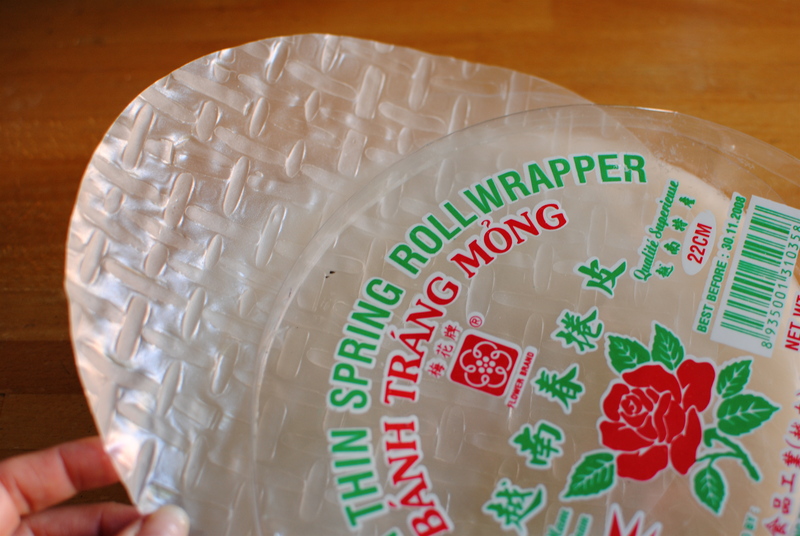 And these delicate yet somehow robust translucent rolls do it for me. I hope they do it for you to. If it stops raining around here they will make it into the picnic basket, along with a giant umbrella. Just in case. 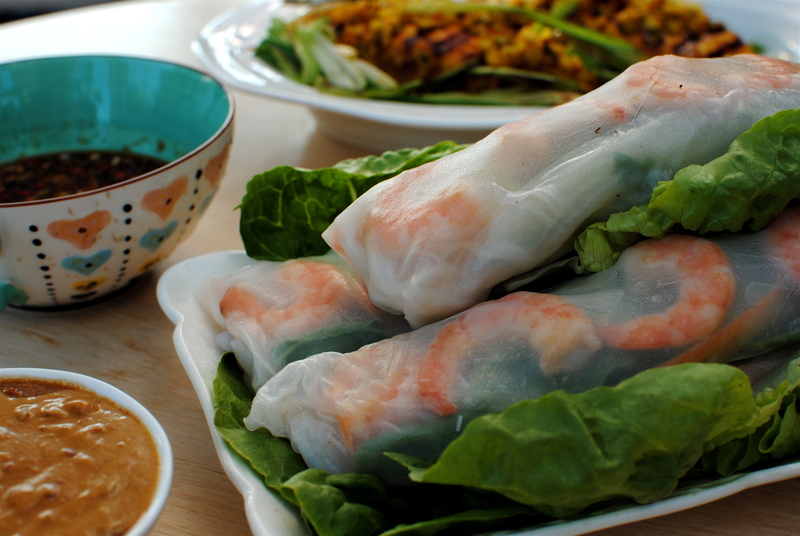 You probably know this, but summer rolls are Vietnamese in origin, where they are called goi cuon – literally, salad rolls. They sometimes get called crystal rolls and fresh rolls. So delicious and simple are they that the idea has been endlessly adapted. Much nicer and less guilt-inducing than their fried spring counterpoints, in my opinion. Most traditional recipes will included boiled and sliced pork and fried egg, while vegetarian versions use tofu rather than pork and prawn. Always with sour-hot nam chuoc. I could drink the stuff. Tempting coffee cup of it below. This recipe is verging on traditional, but with a few foodtoglow tweaks. The biggest being the lack of beansprouts. With the recent link between beansprouts and a major E. coli outbreak, I didn’t think it responsible to include them. But I’ve added plenty of crunch to make up for their absence. I was also thinking that, like lettuce leaf-wrapped Vietnamese pork balls, you could forgo the rice wrapper and fold all of your ingredients in a soft butter lettuce leaf, maybe tied with a chive. Ooh. Now I’m going all fancy. Another change is the sauce. Usually peanut, I thought almond would be a slightly better health choice. And I love the flavour. If you can’t get affordable almonds go ahead and use peanuts or even peanut butter, but the almonds are sine qua non to me. Nutritionally they are very similar, despite peanuts being legumes and almonds being the seed of the fruit of the almond tree. I always thought that peanuts had pro-inflammatory arachidonic acid, but I was wrong and they may actually be anti-inflammatory, like nuts themselves. Plus points for all nuts are that they may help to protect against cardiovascular disease, diabetes, cholesterol problems, gallstones and possibly colon cancer. And rather interestingly, almonds in particular may help with weight issues: a one ounce portion a day has been recommended for those trying to lose weight as the combination of their protein content and monounsaturated fats promote satiety and fat-burning. And, peanuts and peanut butter may help keep your weight up when undergoing cancer treatment. I recommend it as an add-in to banana smoothies and some prescription supplement drinks. A one ounce serving of either nut delivers about 160 calories, 14 g fat (almonds have more healthy monounsaturated fat) as well as Vitamins E, B2, B5 and calcium, iron, magnesium, potassium, zinc and Omega 9 fatty acids. Because of the high vitamin E and zinc content both nuts are a must for those wanting better skin. Can’t get enough information about almonds? Then click here. Please, please don’t be put off by the rather long list of ingredients. It’s just a bit of chopping, stirring and folding. Nothing has to rise or be flambéed. Very relaxing little recipe actually, especially with a cheeky little Thai beer by your side (are there Vietnamese beers in this neck of the woods?). Once you get a rhythm to the folding – like pancakes, the first roll is usually a bit of a dud/cook’s perk – this is a quick recipe, especially if you have made the almond sauce in advance. You can quicken this recipe if you like by using bought peanut butter or almond butter, but I truly think the toasting and grinding of the almonds makes for a better-textured, authentic taste. Fresher, too. Commercial nut butters invariably have added oil, so the DIY approach can also save a few fat grams. However, if you need to gain weight, and are low in energy, definitely go the prepared nut butter route. Any of you who have read my About section may remember how I said that I won’t use weird ingredient – or something to that effect. I still stand by that but, as I make a heck of a lot of Asian food, I don’t consider tamarind, fish sauce and rice paper wrappers weird. You may feel differently. I don’t want you not to make this recipe because you don’t have some of the ingredients so I will offer alternatives that admittedly I haven’t tried, but should probably work. Just in a different way. Finely grind almonds in a food processor or mini chopper, careful not to make paste as you want texture. Put aside. Heat oil over a low flame, add the garlic and sauté for one minute. 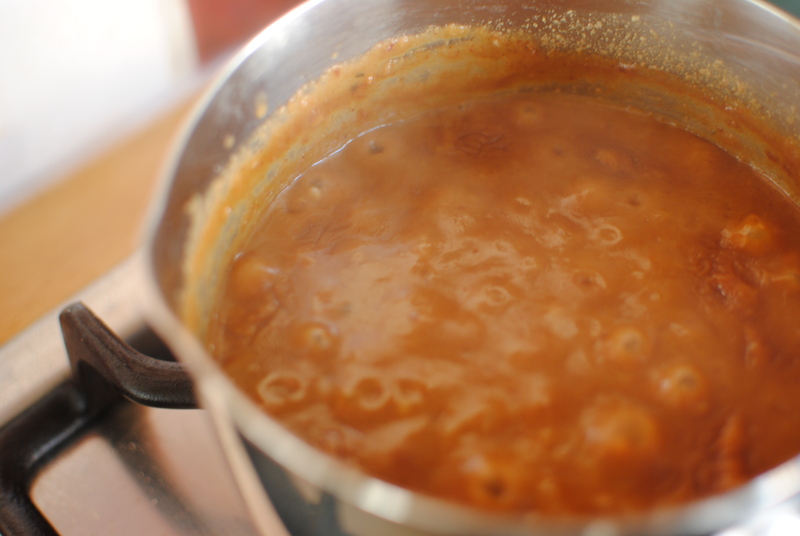 Add the almonds, coconut milk, water, fish and soy sauce, sugar and chilli, then simmer for 20 minutes until thickened and reduced. Pour in lime juice and mix well. Taste and adjust seasoning/lime. This sauce really benefits from cooking and being allowed to cool to just above room temperature. Heat the oil in a sauté pan and add the prawns and tamarind sauce, sautéing until the prawns are uniformly pink. If you don’t have tamarind perhaps use 1/8 tsp garlic powder, for a different but yummy taste. Or heck – do both; I sometimes do. To assemble the rolls, clear your countertop and have the ingredients ready to roll, including a slightly damp clean tea towel and a dish wide enough for the paper wrappers. Have a lettuce-lined platter at the end of your assembly line. 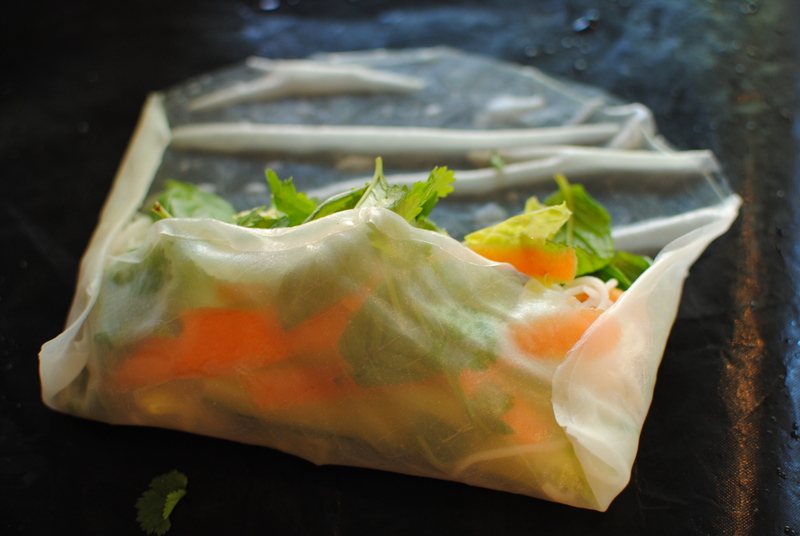 Pour hot water into your bowl or tray and lay in the rice paper wrapper for 10 seconds. Carefully lift the wrapper and lay on the tea towel. 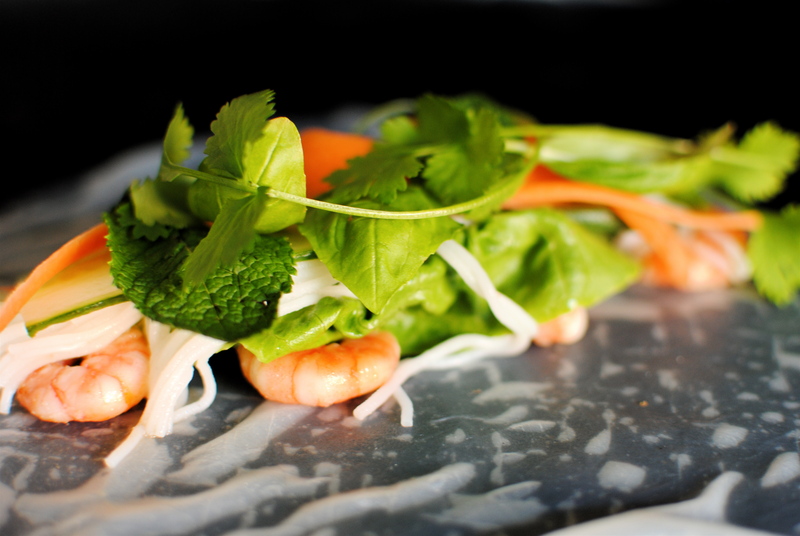 Place 4-5 prawns down the centre of the wrapper, followed by a half lettuce leaf, 1/8 of the noodles and appropriate amounts of the remaining ingredients. Take the bottom edge and fold it over the filling, followed by the sides, and lastly the top edge – you are making a ricey cylindrical envelope. 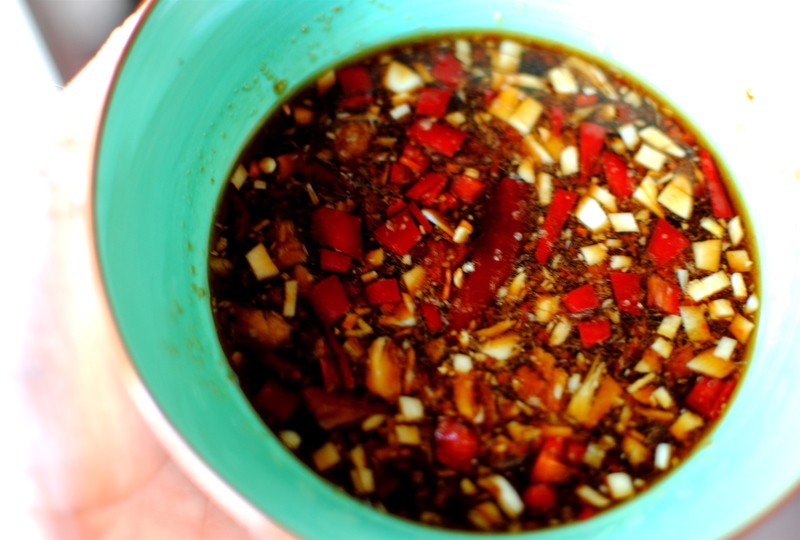 Now make your nam chouc: whisk together juice of 1 lime, 2 tbsp palm or brown sugar, 1 tbsp fish sauce, 1 tbsp shoyu or soy sauce, 1 fat garlic clove (minced), 5 cm piece fresh ginger (minced), 1 red chilli (minced). To serve, slice the rolls on the diagonal and place on a lettuce-lined platter. Pour individual servings of the nam chuoc and almond sauce if possible, or at least the nam chouc. This will make a starter for four or a meal for two. I am posting a complementary salmon recipe next time so perhaps perfect your rolling skills first and then have it again with the salmon (marinated in turmeric and lime among other things). Kellie, this does sound yummy…(I don’t think I’ve ever used that word before). Thanks for your blogs; they’re always fun to read. Aw thanks! Do you think you and Barb will make it? Maybe don’t answer that. Really easy but I give you permission to cheat and use peanut butter (the good kind – not JIf!) Maybe get Madison and Tripp to make these when they next come over. Thanks for reading the whole thing rather than just the preamble! This looks fantastic and is just what our post-holiday-super-overindulged bodies are craving – perfect, it’s on the menu for this week, thanks Kellie! These are right up my alley! 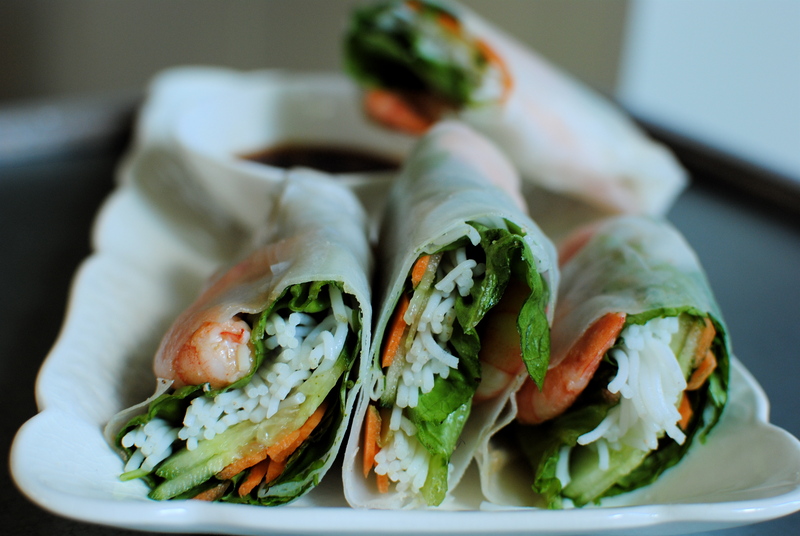 I’ve always bought summer rolls and wanted to make my own. I checked my local grocery and they didn’t have rice wrappers. I’ll have to hunt them down. Thank you! I;m so glad you like the look of this and hope that you’ve got an Asian/Chinese grocers from which to purchase wrappers. As I said in the blog I literally bought the stock so that I can selfishly enjoy them anytime. You can certainly get them online. I accidentally bought some that were too thin (extra thin) for some of my ‘stock’. Don’t make the same mistake – they are a nightmare to handle. Or maybe I am just particularly clumsy. Probably the latter. Let me know if you try them and the sauces. Cheers! Nice try! Too anti-social for cinema (dipping in the dark – hmm) but we’ll make them at yours soon! Would Alex like them? Hope they tasted good though! Let me know. Any Bex tweaks to the recipe? Madison, Tripp and I will be making these this weekend…we’re even going to toast the almonds! We’ll let you know how they turn out. Great! Let me know how you get on – with pictures. They are very more-ish, as we say in these parts. We are up north friday but I have skype on the iPhone, so skype us. May not have reception up where we are though. Try the courgette, lemon and elderflower cake too, but minus the elderflower. Ahhhhh how I miss elderflower. Will do on the skype and courgette! Safe travels! It is such a bummer that you don’t have elderflower, the magic early summer elixir. Oh well. Put the skype on around 10 your time and we’ll pray we have reception in Oban. Let me know how all the kitchen capers turn out.